Blue skies, nice temperatures and spring are things all associated with one of the biggest and most exciting of the Spanish fiestas. 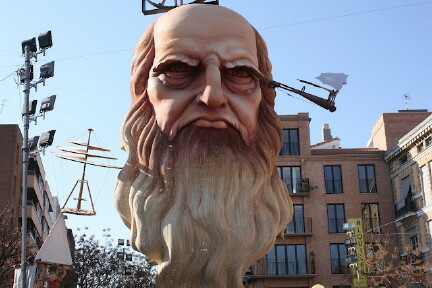 The Fallas in Valencia are many things but it is the actual amazing two storey high statues that are called Fallas and are built, decorated and designed to be burned at the end of the week’s celebration. By wandering around Valencia they can be found virtually on every other street corner.They are quite spectacular and unique to this springtime festival. But this fiesta is without doubt about noise; fireworks,music and fire. A pyromaniac’s paradise! It is a spectacle which is difficult to understand until you have experienced one. A huge banger display which shakes you to the bones and will not leave you unimpressed. 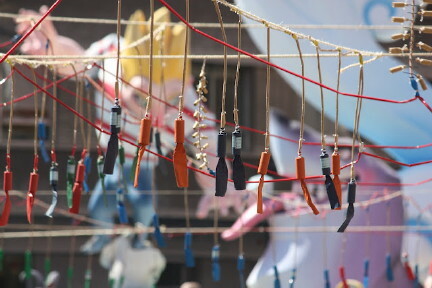 A lot of people find them excessive but then that is what most Spanish fiestas are about! You can see the big one in the main square(at 14.00 daily) or see the smaller ones close up in the barrios(different quarters). And, of course there are music bands and falleros are everywhere. So if you are not afraid of fireworks and large amounts of people this fiesta is not to be missed. This year there are over a million visitors to Valencia in four days and it is reported there will be 800,000 people at the firework display of tonight 18th March. The Nit de Foc as it is called is a truly spectacular show and a great fiesta atmosphere. 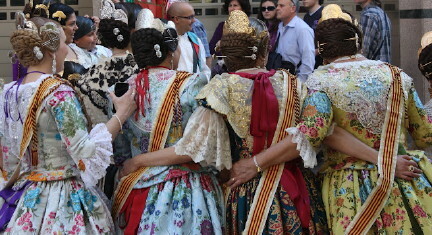 I will let the photos this week do the talking but Fallas is Valencia at its best. 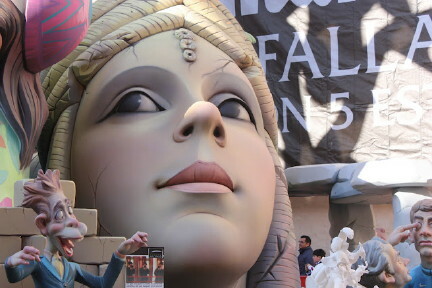 This Falla was in a square called Na Jordana…Michelango..Stunning. A street fiesta with beautiful traditional dress,bangers,music and fun,plenty of fun. 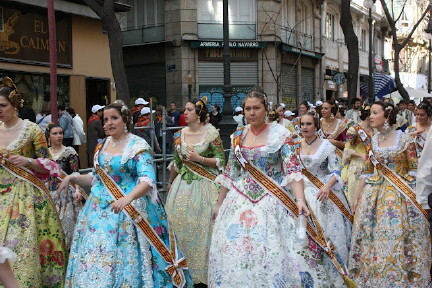 This entry was posted in Fallas, Fiestas, food, holidays, Valencia and tagged Cultural trips, fallas, falleras, Fiestas, holidays, music, real spain, regional dress, spanish food, typical spanish customs, Valencia, visit Vaelncia, wine by Paddy Waller. Bookmark the permalink. aaah great memories brought back, thanks Paddy. I’m sooo jealous, enjoy el nit de foc! Glad you it brought back good memories,Val. Coming from sober Holland, I always enjoy seeing the fun people have in other countries with their fiestas and other celebrations. Love your photos, especially of the colorful dresses. Miss Footloose,Thanks for your comments.The atmosphere here in the fiestas was great. I am sure Moldavia has its good points.I see from your blog you have lived all over.Great to have seen so much of the world. Great article Paddy. Would love to come and check fallas out myself when I get a chance. My blogging friend Adventurous Kate said it was cool too! You got some amazing pics! I’m dying to go to Fallas next year, this year was impossible but heard it was great! Glad you liked the pics.If you have not been they are a totally unique Fiesta.Loads of walking and loads of fun. Ni photos! What camera do you use, if I may ask? Did you get to see any fallas burning? 450D and I use two different lens , a 18-50mm and a 55-250mm.This year I didnt see the Fallas getting burnt but I have seen them many many times over the last 30 years! Have you seen them getting burnt?Well worth it …an experience to remember!